The launch of the first NASA mission developed under the In God We Thrust program, a geostationary sublime reflector, is scheduled for early 2013. "We have a lot of faith in the new procedures," said Dr. Helmer Mountebank, NASA's public relations officer, "and, God willing, the mission will be an stellar success." The impetus for NASA to make the switch from rational to faith-based engineering and aeronautics, Dr. Mountebank explained, grew largely out of the astonishing success of faith-based "intelligent design" doctrine in replacing the theory of evolution in the early years of this decade. "We saw how rapidly and effortlessly the acceptance of purely faith-based precepts replaced centuries of genuine scientific inquiry," said Dr. Mountebank, "but more importantly, we saw how government and private funding sources for faith-based work were exploding like a supernova at the same time that they were as dry as the Sea of Tranquility for secular engineering and astrophysics projects. It was a simple issue of Darwinian pragmatism—survival of the fittest. 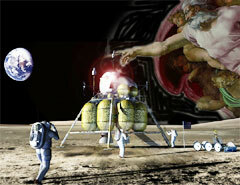 Right now, the fittest is faith-based, so we at NASA really have no choice." According to former top-ranking NASA officials who requested to remain anonymous, the decision to move to faith-based space exploration was also shepherded along to a large extent by the forced attrition of long-standing key secular members of the NASA staff, and their replacement with individuals from the ranks of the "theologically pure" as defined by a Christian fundamentalist president, cabinet, and congress. "I don't know a single person on NASA staff who hasn't been born again at least once," said Dr. Mountebank. He elaborated that the word "faith" in the term "faith-based" is meant to signify Christian beliefs. "We're a Christian nation, after all, so NASA's faith-based In God We Thrust space program will of course also be designed in accordance with Christian teachings. It's just logic," he said. NASA engineers will be basing their rocket and capsule design and space flight calculations on a Christian view of the shape, size and age of the universe as detailed in the Bible, the primary reference work for faith-based scientific initiatives. "We're finding a little trouble with a couple of basic assumptions, including what turns out to be, when we looked it up in NASA's Biblioteca Apostolica, the extremely young age of the universe. Given what we know about the speed of light, this results in some confusion regarding the possible distance of celestial bodies such as stars and planets, many of which now appear to be filling overlapping regions of space. We've also had some issues with the shape of planetary orbits, which we're now assuming to be perfect circles, and the fact that we'll now have to calculate based on a geocentric rather than a heliocentric model," said Dr. Mountebank. "But I think we'll work it all out before NASA launches our first manned mission," he continued. "If there are any blanks, we pray God will fill them in."